Valet testimonials - wheel repaired, leather care, Supagard. "I was absolutely delighted when I picked up my car after valeting. It was spotless, sparkling and looked as good as, better even, than when I purchased it! Before the actual valet all the services available were explained in detail and there was absolutely no pressure at any stage of the assessment. I will not hesitate to use the company again and have already recommended to friends." We made this our car of the week! "Mark was attentive, thorough and helpful in his assessment of my vehicle. My car was valeted, wheel repaired, leather care, all very well. It was what I expected, plus the car was as good, if not better than when I collected it new from the dealership. Fantastic job I will be going back for more!" "Having read some of the many comments of past customers gave me the encouragement and confidence to bring my new car 60 miles to Clean Image. The local Toyota dealer quoted me considerably more. I was happy with the Supagard treatment carried out and the courteous manner and efficiency of work. "We found the service to be very good, valet excellent, odour removal seems to be 100% successful. Would definitely use your services again. Enjoyed the free steak meal!" Just 35 minutes from Colchester! "To be honest, it's hard to criticize. 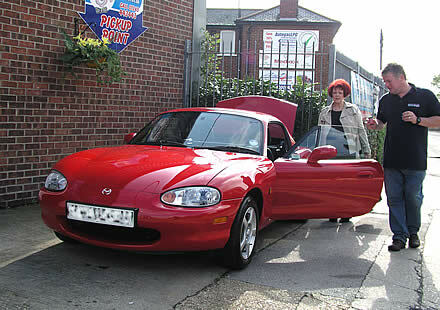 After trying to find a valeting service nearer home and failing, I found Clean Image on the internet. They were well worth the drive to get there. The service was faultless from the initial booking to the actual valeting. Everything was excellent. My car was unbearably smelly, the previous owner having kept dogs and took the Silver Service with all the extras necessary to kill the smell. The results was stunning. My car is a pleasure to drive at last. "Overall I was pleased with the service and would recommend to others. I was originally disappointed with the finish on the dent repair although this was rectified after a brief discussion. Sandra was well pleased with the results of the valet. Finish of the car was excellent. "I was very pleased with the service I received, my seats look fantastic. I have recommended your company to several people. Special thanks to Gary for his help and advice. " "Excellent quality of repairs done to remove scratches, dents and alloy wheel scuffs in a very short period of time. Will recommend to others needing the same. 90% - some water marks left, only complaint." "Was not sure which sealant to use but after talking with Mark decided on the Jewelultra Diamondbrite. Very good application and finish. Looks good.